The new changes made to the Morobe Provincial Governments (MPG) Scholarship Application has not had much popularity with students since it was published a week ago. The new requirements indicate that applications for the scholarships would have to be submitted online, scholarship allocation had been cut down by a million from K5 million and, only students in selected institutions and those enrolled in certain courses will be eligible to attain the MPG scholarship. The students argued that for applications to be submitted online, not everyone especially those who live in the rural areas have access to the internet. Furthermore the cut in the scholarship allocation would mean fewer Morobean students in tertiary institutions, as they are supported by the MPG scholarship. 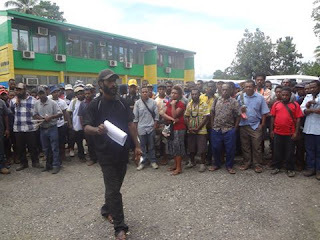 The Morobe Students Union after meeting last week formulated a petition of which a copy was presented to the Acting Deputy Provincial Administrator of Social Services, Robin Bazzinuc at the Tutumang yesterday. He acknowledged that the points on the petition were precise further adding that he will now meet with members of the administration to discuss the resolutions stated in the petition. The petition states that the scholarship allocation should be increased back to K5 million to cater for the Morobean Students and that the administration should strategise on ways to equally spend amongst the 20 institutions rather than excluding some institutions. Morobe Students Union President, Hans Gwaiko on behalf of the students union stated that awareness on the changes as well as consultations should have been made prior to the changes being approved and published few weeks before schools commence their academic years. “We are the ones who are affected by these changes and should have at least been made aware of the changes”says Gwaiko. “Such changes will also affect human resource development for the province” he further added.